We have visited this trail a few times for snowshoeing. It’s an easy beginner snowshoeing trail as it’s wide and flat. 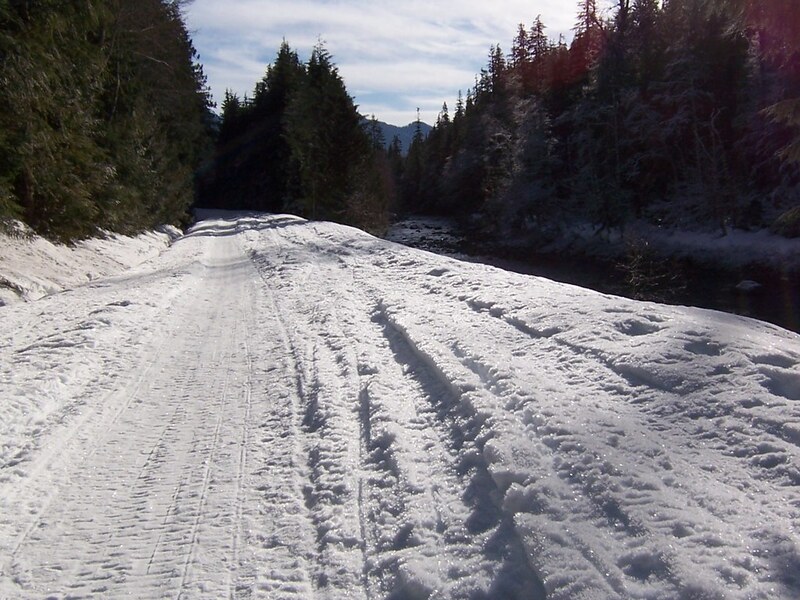 In the winter, portions of the Mountain Loop Highway are not plowed. The snow covered road makes for perfect hiking with your favorite four-legged pal. To get there, take the Mountain Loop Highway out of Granite Falls and continue approximately 12 miles past the Verlot Ranger Station. We always stop at the Ranger Station to check the avalanche warnings. The rangers also hand out dog treats in case your pal needs a pre-hike power-up. The hike along the road has great views of the Stillaguamish River and the mountains. After hiking about 2.5 miles, you’ll come to the Big Four Picnic Area, where you can stop for lunch and throw snowballs for your dog. The trailhead to the Big Four Ice Caves is located at the picnic area, but there are signs warning that there is a high avalanche danger past the river at the ice caves during the winter, so we have not visited them. The only negative about this trail is that it is always very busy. There are snowshoers, cross-country skiiers, and snowmobilers. 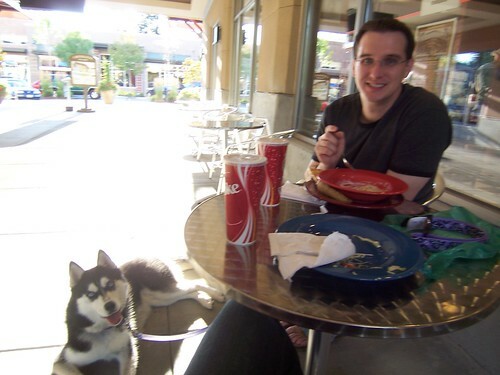 There are also usually people with their dogs off-leash as well, so if you have an unfriendly dog, keep your eyes open. The trail is open so you can typically see far enough in advance to prepare for meeting unleashed dogs, snowmobiles, etc. 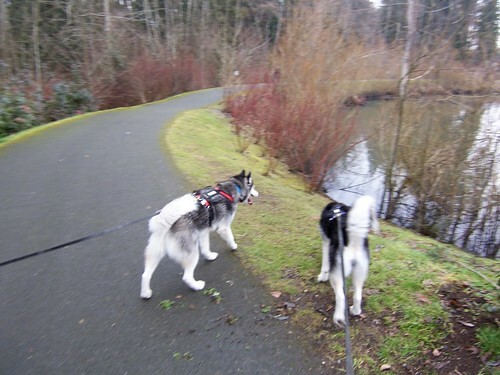 We rode bikes with the dogs along the Sammamish River Trail from NE 145th Street to NE 124th Street in Woodinville. It was a very nice January day, so the trail was quite busy, however, it’s a wide, paved trail, so there was plenty of room for all users. There is grass along both sides of the paved trail, so you can let your dog run in the grass, while still riding your bike on the paved area. 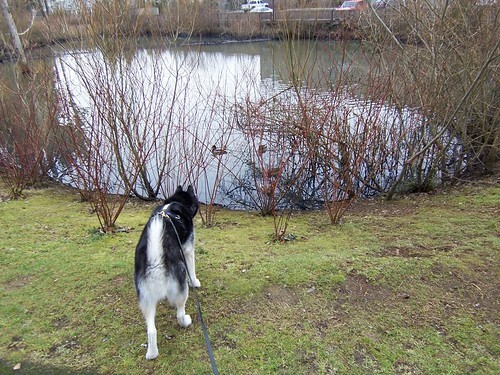 Once you are on the trail, it’s pretty straight, so there aren’t worries about maneuvering with your dog around tight corners. Going south on the trail, on a clear day, you can see a great view of Mount Rainier.